Sociology should be the foundational science of social emergence. But to date, sociologists have neglected emergence, and studies of emergence are more common within microeconomics. Moving forward, I argue that a science of social emergence requires two advances beyond current approaches—and that sociology is better positioned than economics to make these advances. First, consistent with existing critiques of microeconomics, I argue that we need a more sophisticated representation of individual agents. Second, I argue that multi-agent models need a more sophisticated representation of interaction processes. The agent communication languages currently used by multi-agent systems researchers are not appropriate for modeling human societies. I conclude by arguing that the scientific study of interaction and emergence will have to migrate out of microeconomics and become a part of sociology. Sociologists, for their part, should embrace multi-agent modeling to pursue a more rigorous study of these traditional sociological issues. Social emergence is the central phenomenon of the social sciences. The science of social emergence is the basic science underlying all of the social sciences, because social emergence is foundational to all of them. Political science, economics, education, history, and sociology study phenomena that socially emerge from complex systems of individuals in interaction. In this chapter, I argue that sociology should become the basic science of social emergence, and I outline a theoretical framework to guide this study. But this is not the sociology we see today; few sociologists study social emergence. In the second half of the twentieth century, economics has made the best case for being the foundational social science, by making social emergence central to its theory and practice. Perhaps the most important strength of the neoclassical economic approach is that it has rigorous formalisms for modeling the ways that individual action generates aggregate outcomes at the level of an entire population (Bowles, 2001; Durlauf & Young, 2001). Because social emergence is the central phenomenon of the social sciences, and economics has developed the most successful model of social emergence, this has naturally led to “economic imperialism,” with neoclassical economists beginning to analyze non-economic phenomena traditionally associated with sociology (Boulding, 1969, p. 8; Hirshleifer, 1985; Radnitzky & Bernholz, 1987; Tullock, 1972). These imperialists argue that economics is “the universal grammar of social science” (Hirshleifer, 1985, p. 53), and that it simply represents “straight thinking” applied to social science (Radnitzky, 1992, p. 15). And, in fact, microeconomics has been the only game in town for those interested in studying social emergence. However, there are many problems with the models of social emergence dominant in microeconomics. 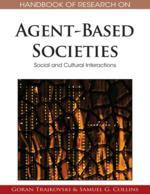 Critics such as the “New Economic Sociologists” (see Krier, 1999; Zafirowski, 1999) claim that the microeconomic account of social emergence is empirically unfounded, methodologically individualist, neglects the social embeddedness of actors, neglects the importance of institutions and social networks, and neglects the unavoidable inefficiencies introduced by institutions, power, and path dependence. I focus on two specific critiques in this chapter. The first one is well known: many critics of microeconomics have called for a more sophisticated representation of the individual agents. Some agent models have begun to develop more accurate agent representations by drawing on the field of cognitive psychology, and occasionally on sociological theories of agency. My second critique is less widely acknowledged: I argue that microeconomics radically simplifies important elements of social emergence—particularly, the key role played by symbolic interaction. Microeconomics uses formalisms that impose a simplistic representation of individual agents, and a simplistic representation of agent interaction. Some microeconomists have begun to use multi agent system models, but when they do, they tend to reproduce the overly simplistic models of agents and agent interaction associated with the optimizing mathematics of rational choice. Multi-agent models, whether developed by economists or by sociologists, need a more sophisticated representation of interaction processes. The most sophisticated of these are modeled using what is called an Agent Communication Language (ACL), but the ACLs developed to date in the MAS research community are not appropriate for modeling human societies. Social modelers can develop better representations of interaction by drawing on the science of microinteraction within sociology. I have done several empirical studies of emergence in conversation, and I have shown that different communication mechanisms change the processes of social emergence (e.g. Sawyer, 2003b). This leads to a second critique of rational choice models: such models of social emergence have a radically simplified account of human interaction.